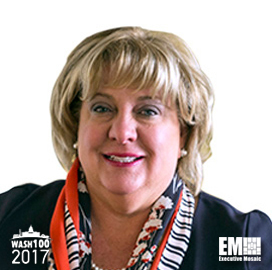 Executive Mosaic is glad to recognize Susan Penfield, an executive vice president at Booz Allen Hamilton, as an inductee into the 2017 edition of the Wash100 — Executive Mosaic’s annual selection of influential leaders in the government contracting arena. The two-decade Booz Allen veteran was appointed to head the McLean, Va.-based government services contractor’s Strategic Innovation Group in March 2016. In that capacity, Penfield works to advance SIG’s innovation programs in the analytics, digital and cyber areas to address technical challenges that customer agencies face. In her former role as head of Booz Allen’s health business, she advised federal agencies such as the National Institutes of Health, the Centers for Disease Control and Prevention and the Food and Drug Administration on various large-scale healthcare programs. The two-time Wash100 inductee also is a strong advocate of women’s and children’s health, veteran reintegration efforts and advancement of women in the workplace. Penfield also currently serves on the board of directors at the NIH Children’s Inn, Women’s Center of Vienna and American Red Cross National Chapter.